I really should have spent this weekend working on a cosplay for Emerald City Comic Con, but I ended up working on this little project. 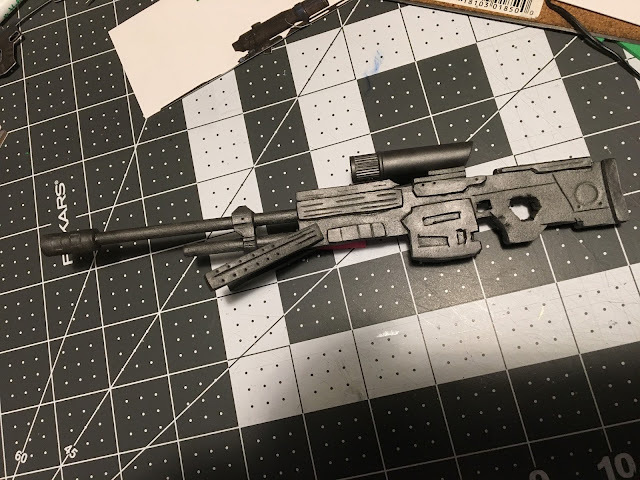 It's a mini Halo sniper rifle! I started by finding an image of it (and a rocket launcher for a future build) and printing it out on card stock. The basic premise is cutting out the image, tracing the basic shape onto foam, then building it out in layers. I used 6mm foam as a base, 3mm foam for the accents, wooden dowels for the barrel, and a pen cap & tire valve cap for the sight. Everything was primed and then painted with a gun metal acrylic airbrush paint. Then some blue & copper accents along with black airbrushing to give it some depth and weathering and it's finished! A look at the other side. And the reason I made this? My friend made me a chibi Master Chief and I had to give him a weapon! This was a fun weekend build which actually took way longer than I thought it would. But it gave me a bit of confidence to do some life size weapons as doing them in this scale felt way more difficult because of the small size. But still, all in all a really fun project.